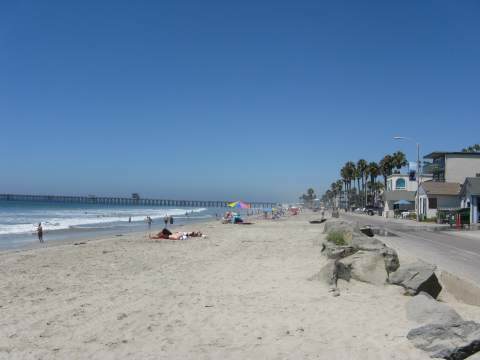 San Diego Beaches span the entire Pacific Coast of San Diego county, stretching from San Onofre in the north, to Imperial Beach in the south. With 70 miles of beautiful beaches to explore, San Diego offers a variety of beaches for swimming, surfing, relaxing and sightseeing. This page has a San Diego beach map and beach guide to the most popular San Diego county beaches. Click on above link to show legend and open in Google Maps. For beach information, detailed driving directions and parking information, click on links for individual San Diego area beaches. These beaches are listed from north to south. Oceanside Beach, Oceanside – from Interstate 5 go west on Mission Ave.
Carlsbad Tamarack Beach, Carlsbad – from Interstate 5 go west on Tamarack Ave.
Beacons Beach, Encinitas – from Interstate 5 go west on Leucadia Blvd. Moonlight Beach, Encinitas – from Interstate 5 go west on Encinitas Blvd. Fletcher Cove, Solana Beach – from Interstate 5 go west on Lomas Santa Fe Dr.
Del Mar City Beach, Del Mar – from Interstate 5 go west on Del Mar Heights Rd., right on Camino del Mar, then left on 15th Ave.
Torrey Pines Beach & Reserve, La Jolla – from Interstate 5 go west on Carmel Valley Road, park on left or turn left on North Torrey Pines Road for closer parking. 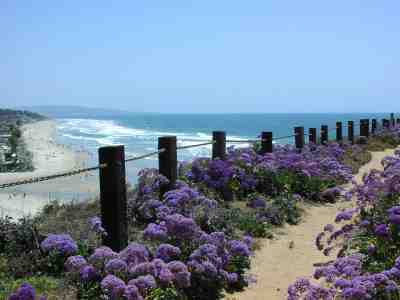 Black’s Beach, La Jolla – From Interstate 5 go west on Genesee, left on Torrey Pines Rd. then right on Torrey Pines Scenic Drive to the dirt parking lot. Requires hike down steep trail. La Jolla Shores – from Interstate 5 go west on La Jolla Village Drive, left on Torrey Pines Road, right on La Jolla Shores Drive, then left on Vallecitos. La Jolla Cove – from Interstate 5, go west on La Jolla Parkway, continue on Torrey Pines Road, right on Prospect Street, and right onto Coast Boulevard. La Jolla Children's Pool – from Interstate 5, go west on La Jolla Parkway, continue on Torrey Pines Road, right on Prospect Street, and right onto Coast Boulevard. Located past La Jolla Cove and Ellen Browning Scripps park. Windansea Beach – from Interstate 5 go west on La Jolla Parkway, continue on it as it becomes Torrey Pines Road, right on Pearl Street,left on La Jolla Boulevard, then right on Nautilus and head west to the Pacific Ocean. Pacific Beach, San Diego – from Interstate 5 go west on Grand Ave. then right on Mission Blvd. 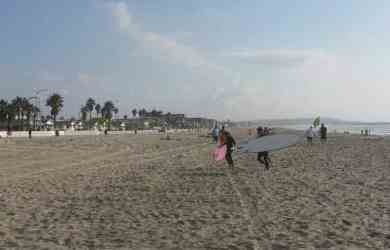 Mission Beach, San Diego – from Interstate 5 go west on Grand Ave. then left on Mission Blvd. For Belmont Park continue to West Mission Bay. Ocean Beach, San Diego – from Interstate 5 go west on Interstate 8, west to Sunset Cliffs Blvd. then right on West Point Loma Blvd. Coronado Beach, Coronado – from Interstate 5 just south of downtown San Diego, take the Coronado Bridge, turn left on Orange Ave. toward the Hotel Del Coronado, then right to the ocean. Imperial Beach, Imperial Beach – from Interstate 5 go west on Palm Ave.